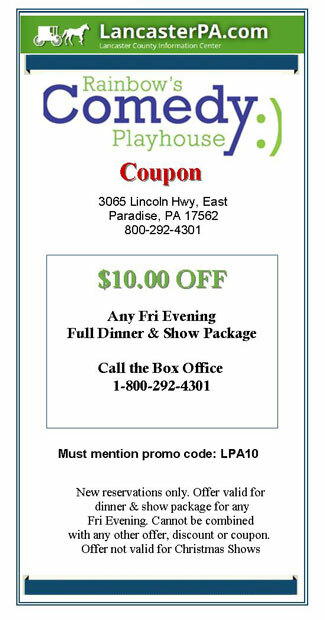 Coupon Savings – $10.00 off Any Friday Evening Full Dinner & Show Package. For over 30 years now Rainbow has been making people laugh. First, start with a delicious meal. Then sit back and enjoy light-hearted entertainment at their theater in Paradise, PA.
Find more Lancaster PA Coupons here. We have other Lancaster County attractions coupons, too.